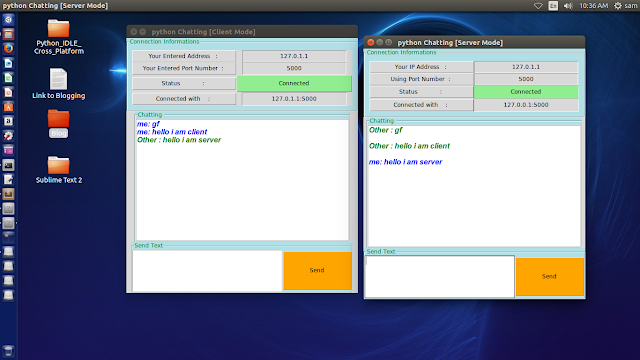 Today I Gonna to show you how to create Real-time chatting program with GUI (Graphical User Interface) using python? Or How To create chatting client and server using Python socket, Tkinter and threading module? Or How to create Messaging Program using python example? Etc.. Here, I Created a GUI chat program written in python2.7. It is designed to not need a central server and so work very well on LANs that are not connected to the internet. One user starts the program in server mode, listening on a port of their choosing, and then other users will use client mode to connect to their machine. Each new user then acts as a host, allowing other people to connect to them. So, what is chat server? The server is like a middle man among clients. It can queue up to 10 clients. The server broadcasts any messages from a client to the other participants. So, the server provides a sort of chatting room. 1. Accept multiple incoming connections for client. 2. Read incoming messages from each client and broadcast them to all other connected clients. Now, what is chat client? client is another important part of connections. It connects to a remote server, sends messages and receives messages. 1. Listen for incoming messages from the server. In This Script, I tried to write code that are compatible with python2.7 and python 3.5 also. folder then open scripts names Main-Gui.py. Then You will see an Small Dialog window asking for server or client mode. For chatting one user have to select server mode and another user has to select client mode. If You are using server mode then you have to give your ip address to client mode user for creating a connection between you. if script found any connection. The status button will automatically be changed in green color and now you are ready for chatting. WARNING: This code is just a simple demo showing how to use socket in Python Socket module with Tkinter and threading module. it is NOT a complete project that’s why it has many bugs. If you'd like to implement a real chatroom, you should find some other open source projects. Please, Feel Free To Leave A Comment If Our Article has Helped You.